As a daily commuter in to Manchester city centre I have been travelling the route along Wilmslow Road and Oxford Road for 5 years. Over this time I have had my fare share of close calls, near misses and heart stopping moments. One thing that I have learnt over this time is that you cannot take anything for granted and every time I set off, I never know how the journey will go as danger is always there no matter how carful I am. One thing that is always a worry is the danger of cars and busses driving to close to me. I have had a number of close calls where vehicles have come within cm of me which is a scary moment as one slip means that I the cyclist will come off second best to a huge vehicle. The route I take has seen a huge investment in so called safe cycling lanes but even this has brought about its own problems. Often it is safer to take to the main carriageway to avoid glass, litter, slow cyclists and pedestrians. Two incidents have stuck in my mind over the last 5 years, both of which I feel have put me in grave danger when a vehicle has come from behind me and left no space. One incident happened in September 17 and as you can see from the image taken from my camera, the Gett Together taxi left me no room at all. That morning I chose to take the road option alongside Whitworth Park. Although there is an off road cycle lane this is often busy with other slower cyclists and this morning was no different. 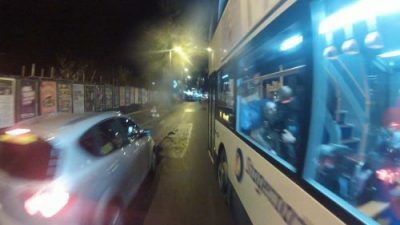 As I entered the bus lane, the taxi/minibus came from behind and cut me up leaving me only a few cm gap. Further up the road I challenged the driver and his response was “I thought you were in the cycle lane”, no apology and in his eyes he thought he did no wrong. Dangerous Driving? What do you think? Another incident happened in December 2015, a Stagecoach Bus again came from behind and left me no room. It was a dark and wet night in Rusholme I was travelling south and in the road to avoid the parked cars to my left. The bus who set off behind me at the traffic lights and who was well aware of me decided to pass me at such a distance it made me wobble and in danger of falling off. Again when i politely challenged the driver at the next lights, he denied doing it and told me he was a professional diver that takes care. Again, I don’t agree. Whilst I understand that the roads are busy and accidents do happen, there is no need for such close passes. 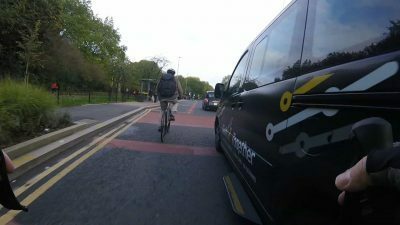 A Taxi Driver or Bus Driver who can clearly see a cyclist yet travel so close they could kill them is dangerous driving!